Jim Farley, left, will become Ford's president of new businesses, technology and strategy, while Joe Hinrichs, centre, will become president of automotive. Marcy Klevorn will retire after more than three decades with the company. DETROIT — As Ford CEO Jim Hackett works to transform the company, his top lieutenants will take on new roles: One will be responsible for making money and the other will spend it on future tech and innovation. 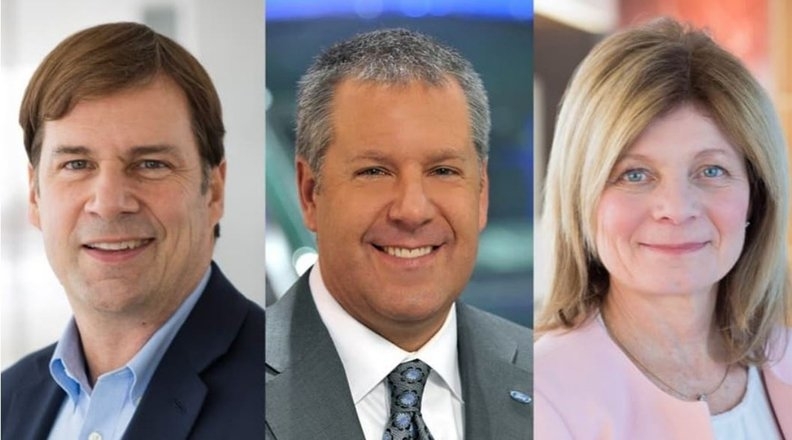 Jim Farley, 56, Ford's president of global markets, will take over Marcy Klevorn's mobility role in his new title of president of new businesses, technology and strategy. He'll oversee strategy, Ford's Smart Mobility subsidiary, its autonomous vehicle unit, research and advanced engineering, corporate partnerships and global data insight and analytics. Joe Hinrichs, 52, Ford's president of global operations, will become president of automotive. He'll be in charge of Ford's global operations, including product development, purchasing, manufacturing, and marketing and sales, as well as the company's global business units: North America, South America, Europe, China and International Markets Group. Klevorn, 59, president of mobility, will retire in October after 36 years with the company. Farley and Hinrichs’ appointments are effective May 1. Additionally, John Lawler, currently Ford’s vice president, strategy, will take on an expanded role. He’ll lead corporate strategy, business development and global data insights and analytics. The move comes a few weeks after Paul Ballew, who previously led Ford’s data and analytics team, elected to retire effective April 5. None of the moves will affect operations in Canada, a Ford Canada spokesman said. This marks the second top executive shift in less than two years for CEO Jim Hackett, who appointed Farley, Hinrichs and Klevorn to their current roles after he was named CEO in May 2017. "In the past two years, we have made tangible progress in improving the fitness of our business, overhauled our regional strategies, created a winning product portfolio, and are working to transform Ford to succeed in an era of profound change and disruption," CEO Jim Hackett said in the statement. "With this strong foundation in place for our auto and mobility businesses, we can now accelerate our transformation." By expanding Hinrichs’ role, Ford is handing him the reigns to the day-to-day business. He’ll oversee the reorganizations in markets like Europe and South America, and will lead Ford’s drive to improve profit margins in North America. Farley, meanwhile, now takes responsibility for Ford’s future-minded endeavors. The automaker is preparing to launch a Level 4 autonomous vehicle in 2021 for commercial use delivering packages and other goods. Hackett, speaking to the Detroit Economic Club earlier this week, said 2019 will be a year of execution following what he termed a “mediocre” 2018.